A new Congress strategy has been visible in recent weeks. It is a simple and effective one. The strategy runs something like this: whenever there are corruption scams to be talked about, the Gandhi family will take the backseat, and possibly missing in action (MIA). When it comes to attacking the Modi Sarkar on ideological grounds (anti-poor, secularism), Sonia and Rahul will be at the forefront. Sonia Gandhi, her son Rahul and daughter Priyanka sneaked out of the country before International Yoga Day for allegedly personal reasons. This is perfectly all right, but is it just coincidence that for the next two weeks, the Congress and the media have been in a feeding frenzy over scams involving all BJP states and the centre, the family is completely MIA? Sushma Swaraj has been under attack for abandoning normal ministry protocol to enable Lalit Modi to obtain British travel documents; Vasundhara Raje has been literally under siege daily for being a business partner of Lalit Modi in dubious circumstances; the Madhya Pradesh government has been on the backfoot over the Vyapam scam, which has seen many of the accused dying under unexplained circumstances; a couple of Maharashtra ministers - Pankaja Munde and Vinod Tawde - have been blasted for scams involving their ministries. In all these “scams”, no member of the Gandhi family has been at the forefront of accusations. They obviously timed their exit in such a way as to allow others to do the talking. The attacks on Vasundhara Raje have been orchestrated by Sachin Pilot and Jairam Ramesh; the attacks in Madhya Pradesh have been led by Digvijaya Singh and other low-level Congress flunkies. Even Jyotiraditya Scindia, who is related to Vasundhara Raje is MIA. The strategy behind this can only be speculated on, and this is what it looks like. The Gandhi family is missing in action because it makes for an easy target if either Sonia Gandhi or Rahul is seen to be leading the onslaught. Sushma Swaraj's help to “fugitive” Lalit Modi - the “fugitive” label being stuck on him by the media and the Congress purely on the basis of a couple of show cause notices issued by the Enforcement Directorate - falls flat when compared to the kind of help the Gandhi family gave to its own pet fugitive, the late Ottavio Quattrochi, a key player in the Bofors payoff scandal. Quattrochi was Sonia Gandhi's pal, and the UPA government not only did not chase him, but also allowed him to take his scam money and run. The UPA unfroze Quattrochi's bank accounts, enabling him to take his scam-tainted money. If the Gandhis had taken on Swaraj themselves, the Quattrochi issue would surely have come up for discussion. Vasundhara Raje is being attacked by Sachin Pilot and not Rahul Gandhi for it immediately brings Robert Vadra's own land-grab cases in Haryana and Rajasthan to the fore. 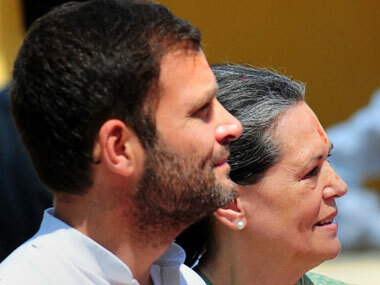 In fact, a case involving Sonia's and Rahul's own property grab - the transfer of the Rs 5,000 crore Herald properties to their private trust using party money - is being heard in a Delhi court. Raje is being targeted by lesser fry in the Congress party in order to ensure that no bullets ricochet on the Gandhi family, which is vulnerable on this count. Exit from India for a couple of weeks also allowed the Gandhi family to avoid questions on the 40th anniversary of the 1975 internal emergency imposed by Sonia's mother-in-law and Rahul's grandmother, Indira Gandhi. In fact, most Congress flunkies also eased themselves out of the limelight during the week leading upto 25 June, and some, in fact, managed to claim that LK Advani's interview to The Indian Express on the emergency was, in fact, about Narendra Modi's authoritarian tendencies. Sonia and Rahul have never formally condemned Indira Gandhi's emergency, seen as the biggest assault on democracy in independent India ever. It is more than likely that Sonia and Rahul will focus their attacks on the Modi government largely on the ideological front, where the NDA will be painted as anti-poor, pro-cronies, and anti-farmer. The Gandhis may not take the government directly on any scams, having just lost the last Lok Sabha elections for running India's most corrupt government ever. The strategy seems to be working so far, with Rahul himself kicking off the plan by attacking the government as a “suit-boot-ki-sarkar” during the budget session of parliament. He has obviously touched a raw nerve in Modi's psyche, for the Prime Minister has been trying to reinvent himself as a pro-poor politician in order to shift his party to the centre of the Indian political spectrum - away from its traditional right-wing orientation. Using the minions to have a go at the BJP on corruption is intended to keep the Gandhi family protected from the counter-fire. The Gandhi family went out of the country in mid-June even as the Congress party offered covering fire. Their prolonged absence has thus escaped media comment.